Are any of you moms to little boys? Well, I have two little boys and I have come to the conclusion that boys create some pretty big messes. It seems that everything my boys touch either gets dirty, broken or spilled. They are so much fun but everyone warned me before my first boy was born that I was to "get ready" because boys are so different from girls. After my first son was born, I very quickly realized that they were right. My boys are rough, tough and love to wrestle. Right now, we have just finished potty training one and are in the midst of potty training the other and let me tell you...my bathrooms need cleaning on a daily basis. My boys (as are most that I have met) are terrible aims when it comes to using the potty---if you know what I mean. :) If I don't keep up with the cleaning, the bathrooms can smell quite icky sometimes. I have a can of air freshener in each bathroom but sometimes, it is nice to have something smelling really nice all the time in the bathrooms. Recently, I was made aware of a brand new product from Renuzit that was just introduced and, being that I had never used Renuzit in my home before, was immediately intrigued. 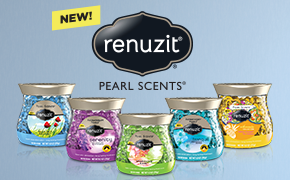 Renuzit Pearl Scents have just burst onto the scene in five different amazing scents and you have the option of picking the scent that fits your personality the best. How cool is that?!? When it comes to the different scents, you can choose from Blue Sky Breeze, Serenity, Sparkling Rain, Tranquil and Seductive Pineapple. I am more of a floral person when it comes to my air fresheners so I am not sure about the pineapple one...I would have to smell it to see if it is something I would enjoy in my home. So, for this review I was sent the Sparkling Rain scent. First of all, I love the container that this air freshener comes in. It is really modern looking and is very eye-catching. From what I have seen, each container is beautifully colored and that can really help when choosing a scent...what color is the room you would put your Pearl Scents in? Color coordination is a number one priority for me when decorating. 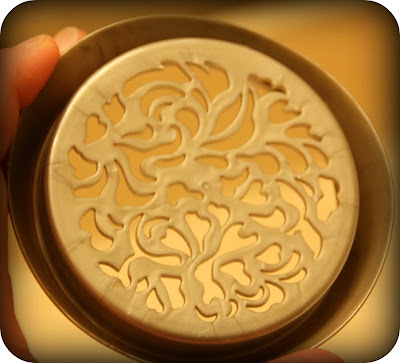 The container itself is sealed with a foil seal and once you pull that off, your jar of pearls is ready to go to work! 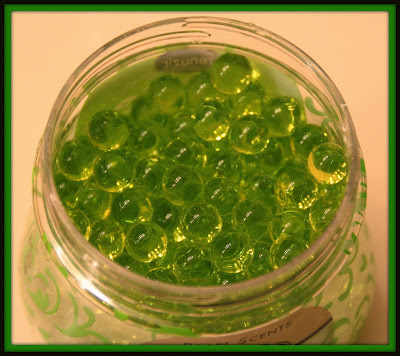 Inside are small marble-sized "pearls" that look wet and these are what will fragrance your home. As a side note and as a mom, I would recommend putting this out of the reach of small children. Mine are candy lovers and as pretty as these little pearls look, they are NOT edible. :) Just wanted to throw that out there. I also love the top of this container. I was slightly disappointed to see that the entire jar including the top was made out of plastic but I guess to keep things cost-effective for us, that is the way it was designed. It really doesn't look cheap though so that is a huge plus. The pretty top is very decorative and looks great anywhere you want to put your pearls. The top is put on the jar once you pull the foil cover off. 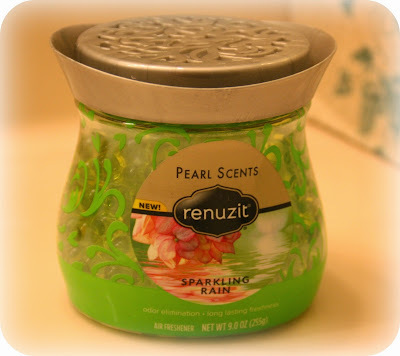 The best place I found to put my Renuzit Pearl Scent jar was on a high shelf in my downstairs half bath. 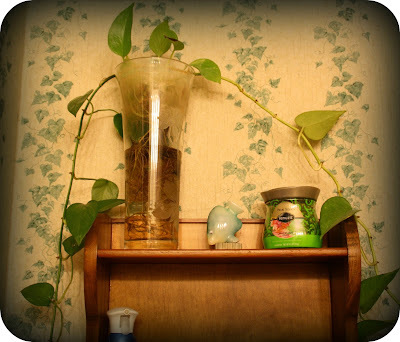 The color scheme in the room itself is ivy and cream so this particular container looks really nice where I put it! I found that the scent was super strong the first day but calmed down quite a bit on the second and third days. It was so nice to walk into my house from being outdoors and smell this air freshener at work. Now, it only fragrances the bathroom in which it is stationed so I love that. 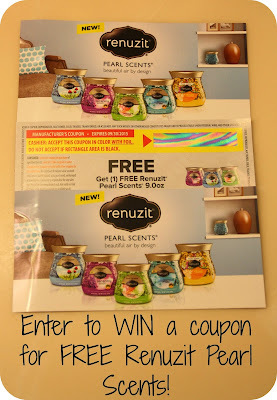 Renuzit Pearl Scents are designed to freshen up to 30 days so we will see how long it lasts in my house. I would love to try the other scents as well...they all sound divine!! 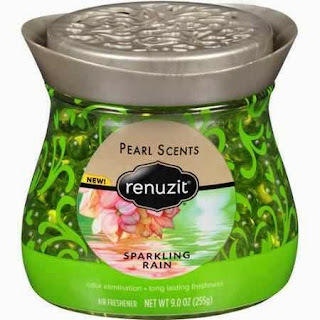 The retail value of Renuzit Pearl Scents is about $4.00 and you can now find them at major retailers across the country. Check them out today and freshen up your home the easy way. Disclaimer: As a Purex Insider, I received no monetary compensation for this post. Renuzit did provide me a free sample of their products for review purposes. All quotes and stock photos are from the Renuzit website and email. Prizes are in coupon form and will be mailed by myself. This blog is not responsible for lost, damaged or stolen prizes and in this case, I am not responsible for replacing coupons under any circumstances. All thoughts and opinions are 100% mine. I would like to try the Seductive Pineapple I like fruity scents over ones that are too perfumy. I would love to try sparkling rain. I would like to try the Blue Sky Breeze. Since I never try these before I think they would be interesting to try! I would choose the Pure Breeze. I would like to try the Sparkling Rain scent the most. I want to try the seductive pineapple scent. I would like to try the Pure Sky Breeze scent. I very much want to try Sparkling Rain. seductive pineapple sounds like that would be perfect for me. I would like to try that scent. I like the Apple & Cinnamon scent. I'd like to try the seductive pineapple. i have to go with the seductive pineapple one. I would like to try the Blue Sky Breeze scent. I would love to try the Serenity scent. I'd most like to try Serenity. I want to try Blue Sky Breeze. I want to try the pineapple one. Sparking rain would be my choice. I would like blue sky breeze. I would love to try Blue Sky Breeze. I would like to try sparkling rain.